A leading consumer goods firm based at Dubai requires Both Male & Female Sales promoters. Posting this job opportunity for the Sales promoter who have have previous experience as a promoter and should be younger than 35 Years of age. – Demonstrate and provide information on promoted products/services. – Create a positive image and lead consumers to use it. – Distribute product samples, brochures, flyers etc. to source new sales opportunities. – Identify interest and understand customer needs and requirements. – Set up booths or promotional stands and stock products. – We are looking for 10 – 25 promoters male and female. – Candidate can be on own visa/Company visa/or husband visa. Graduate /Diploma with adequate years of experience. 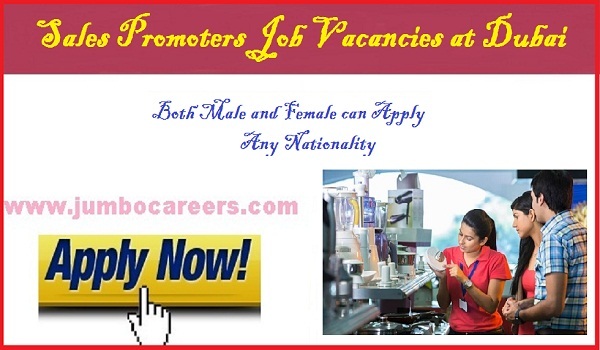 How to apply for sales promoters jobs in Dubai.